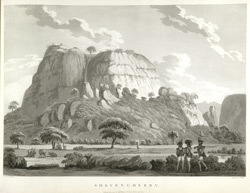 This uncoloured aquatint is taken from plate 15 of Captain Alexander Allan's 'Views in the Mysore Country'. Sivangiridurg was one of the many hill-forts of Tipu Sultan, ruler of Mysore in the late 18th century. It was taken by the British during the third Anglo-Mysore war, and this picture dates from that period. According to Allan, Sivangiridurg was a "small but almost impregnable hill-fort, one mile and a half from Ramgherry, ... capitulated immediately after the fall of Ramgherry, and surrendered to the detachment under Captain Welsh on the 24th December, 1791".